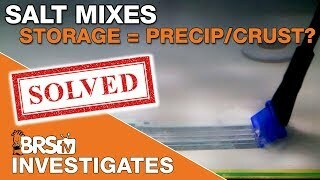 We are expanding our investigative testing on some of our most popular salt mixes by seeking to answer two questions about how long to mix saltwater. 1. 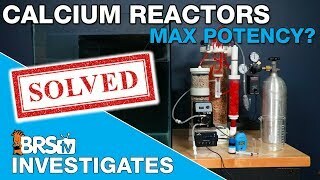 Do salt mixes fully dissolve in less than one hour? 2. Does the speed at which it mixes clear really matter? 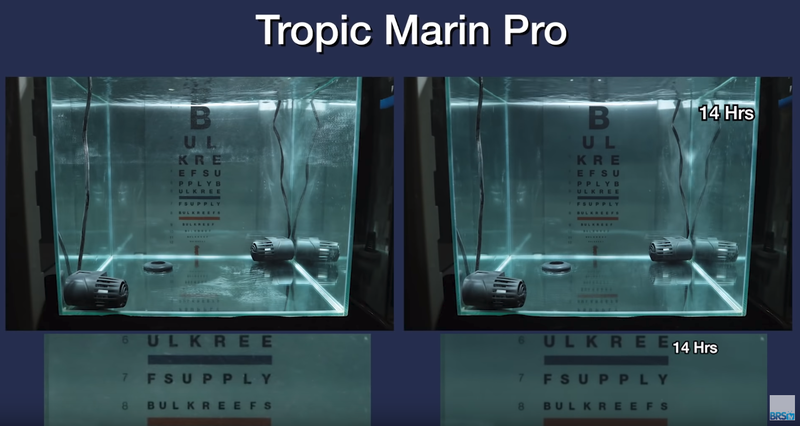 For those of you mixing saltwater as needed, mixing clarity is important to ensure that all the various components of the salt mix dissolve evenly. 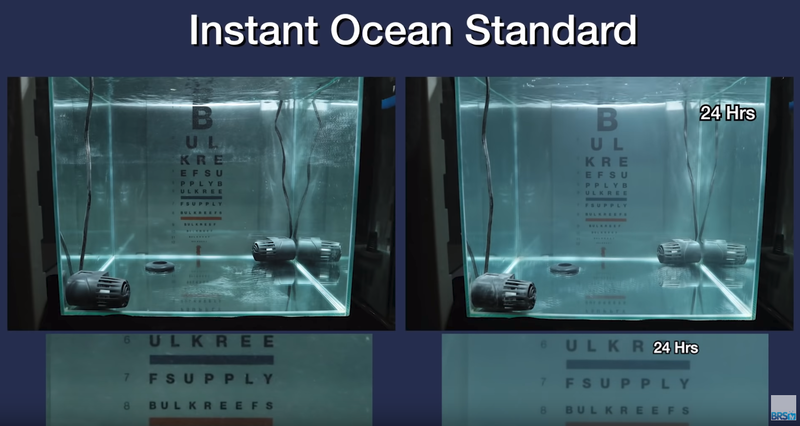 The faster this happens, the quicker you can use it for water changes! 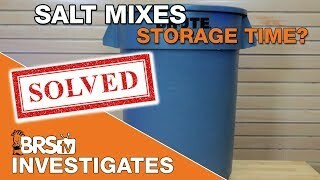 When mixing larger batches to use over time or with auto water exchange systems, knowing how long to mix the salt initially can help to ensure a more homogeneous solution, especially when storing it uncirculated for any period. 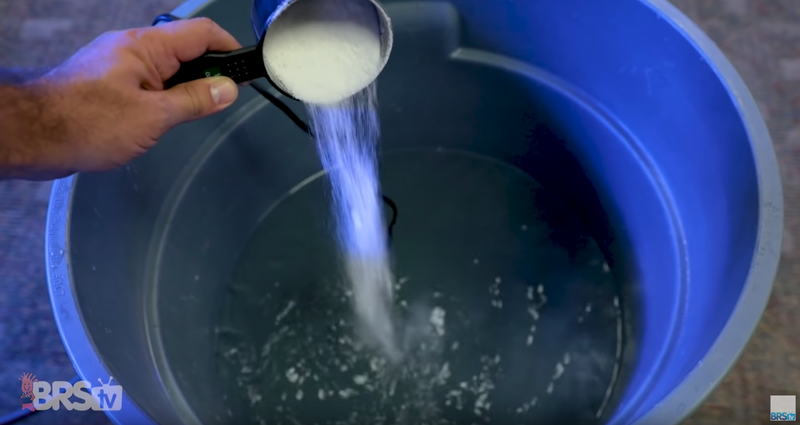 For many us, by simply observing the newly mixed saltwater in a 5-gallon bucket or BRUTE trashcan, it can seem that some salts dissolve faster than others. Some rather quick, within a few minutes, while others will take a few hours or more. Regardless, most all salt mixes will be a majority of the way there, visually, within a few hours. To get better insight into how long it takes for various salt mixes to truly dissolve, we are going to look at absolute clarity in a controlled environment. Many reefers, our staff included, will decide when salt is fully mixed by looking for visual ques such as no large grains or particulates in the bottom of the mixing container and to some degree that the water isn’t severely cloudy to the naked eye. 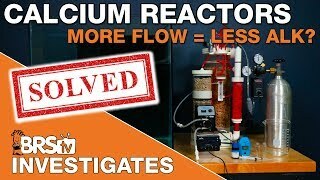 For decades, this approach has obviously produced successful results and it is probably not mission critical that the water is absolutely crystal clear before using it. 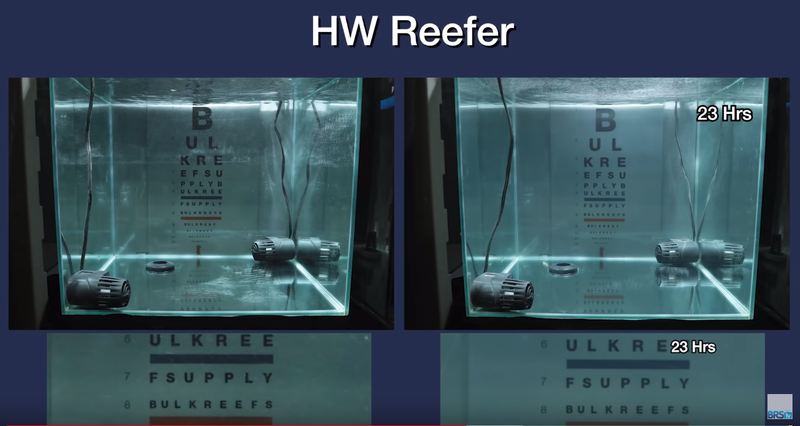 For those of you looking for the best practice, however, these test results will provide a clearer window into how long you should mix your synthetic seawater before use in your reef tank. Is there any benefit to mixing salt water longer than what our eyes can tell us? 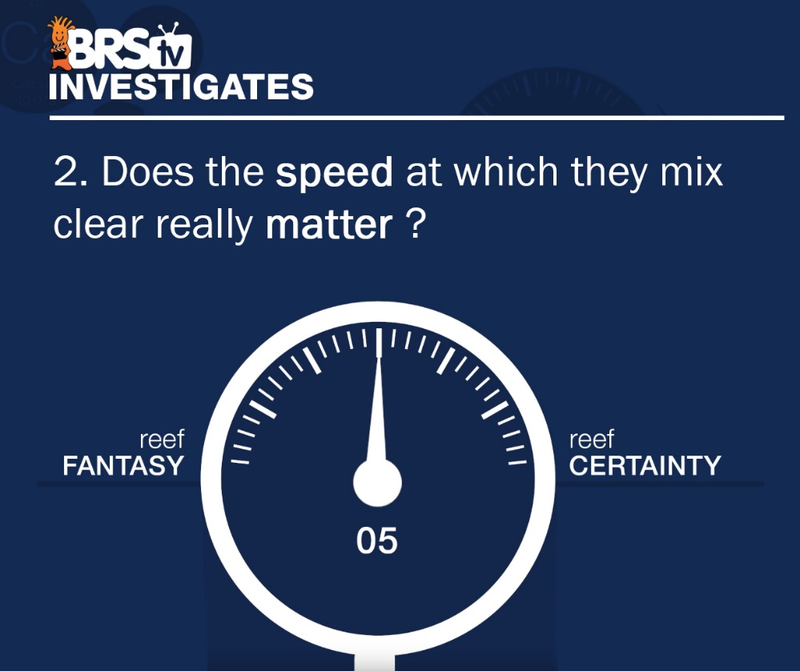 If making decisions for your reef based on absolute best practices, there could be. 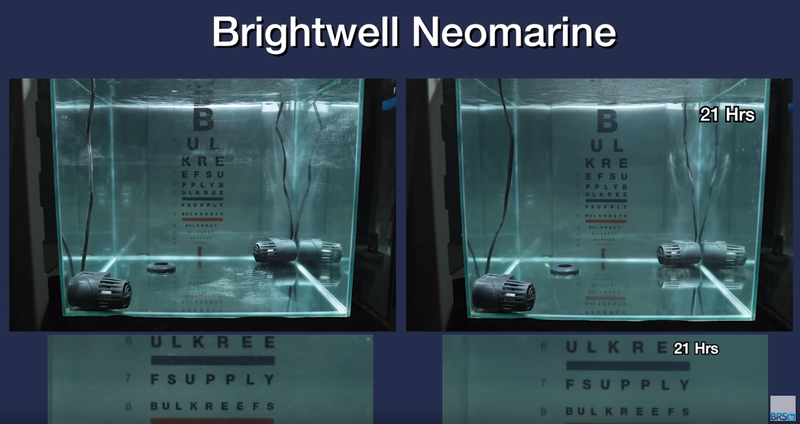 By creating a fully dissolved and homogenous saltwater solution, precipitation is less likely to occur inside your storage container and you will reduce the risk of bio-irritation to corals and fish tissue from the undissolved particles. Using two powerheads to create a vortex, we mixed 20 gallons of salt to 35 parts per thousand (PPT) or 1.026 specific gravity. The water was not heated and mixed at room temperature for a full 24 hours with a complete video time lapse in order for us to monitor the rate at which the salt mix becomes clear. 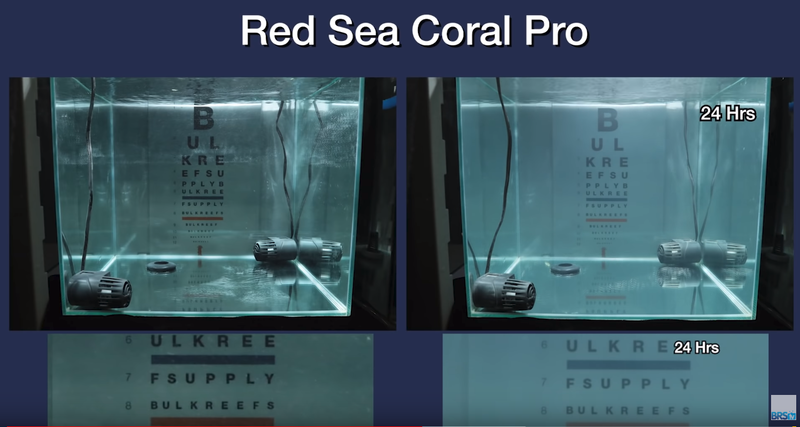 Do determine at what point the salt water would be considered clear, we chose a point at the bottom of the BRS Eye Chart on line 12. When the text on line 12 matches the fresh RO/DI water starting point in terms of clarity, the salt mix was considered clear. We also gauged each salt mix for its color contrast where undissolved microparticles that might reflect light and can’t be seen with the naked eye, clear up to a point where the orange and blue bars of the eye chart resemble the same RO/DI water start point. Mixed for a full 24 hours without a full improvement to the point at which line 12 matched the clarity of RO/DI water. As for contrast, a white haze presumably caused by undissolved particles was still evident at the end of the test indicated the appearance of the orange and blue bands through the mixed saltwater solution. 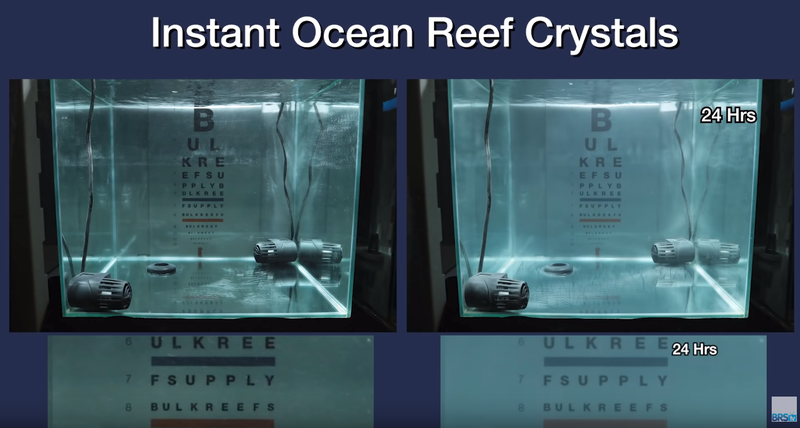 We can see it looks to mix up a bit clearer when compared to reef crystals but still not completely clear at 24 hours when compared to the RO/DI water. 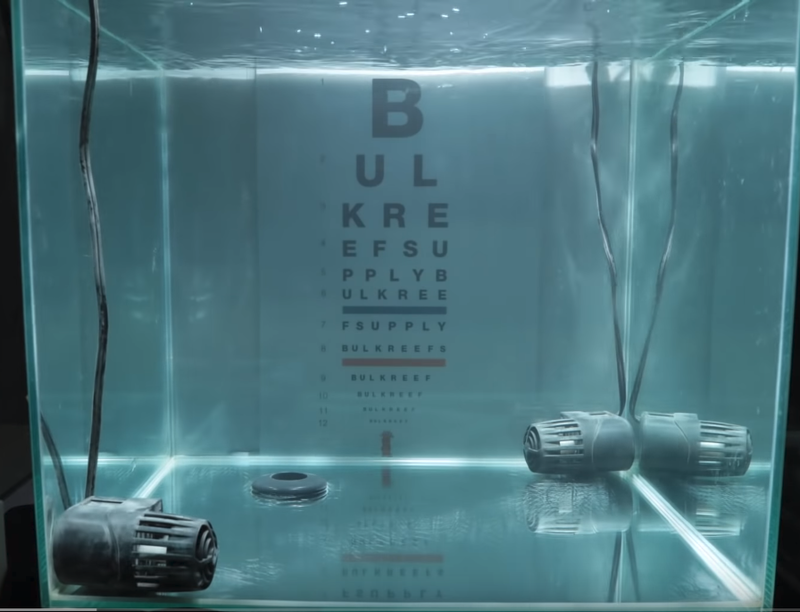 There is still some lack of clarity to the eye chart at line 12 and a slight haze to the tank in the contrast department meaning it is not full homogenized. It looks to start clearing up relatively quickly, within the first 10 hours and continued to gradually improve over time. At the 23-hour mark we called this one dissolved completely, judging by the sharpness of the letters on line 12. For contrast, however, there still seems to be some slight haze to the tank through the 24-hour mark. We saw from about the 5-hour mark and continuing to 20 hours and beyond the contrast or cloudiness in the tank did not seem to settle, evident by the appearance of the orange and blue color bands. For the clarity of line 12 compared to the RO/DI water, this one also doesn’t seem to come fully back to clear within the 24-hour time frame. Started to improve its clarity and contrast at around the 5-8-hour mark and continues to do so throughout the entire test. Around 18-20 hours we continue to see gradual improvements in both categories. Where finally at around 22-23 hours it ends up being pretty darn close to the Fresh RO/DI water both by looking at line 12 and the orange and blue bands of color on the eye chart. Right away, within the first two hours, we started to clearly see the BRS eye chart. The clarity continues to sharpen rapidly where after 7 hours I’d consider this one to be fully mixed from a clarity stand point by the look of the letters on line 12. As for contrast, we are being nitpicky here, but there was a very slight haze to the water up through the 21-hour mark at which it finally cleared up completely. 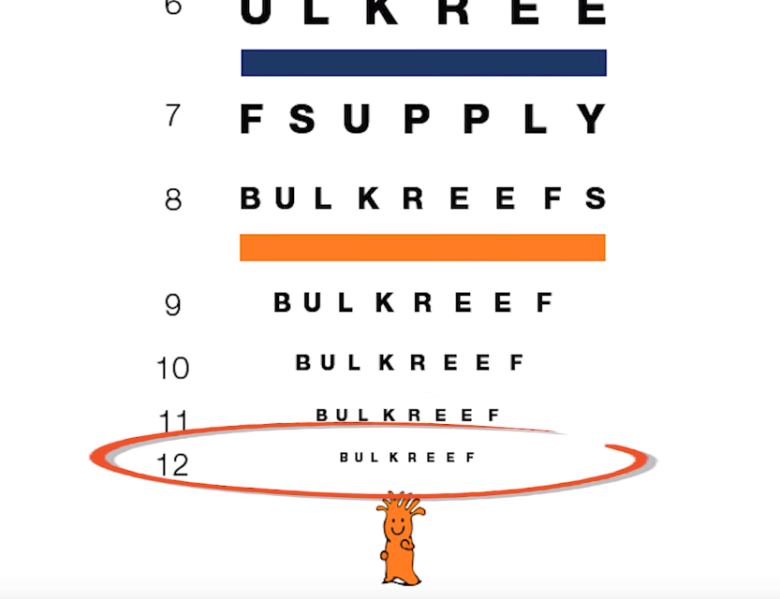 Although there is some clarity to the eye chart after the first few hours. A high contrast cloudiness only slightly improved throughout the entire test. 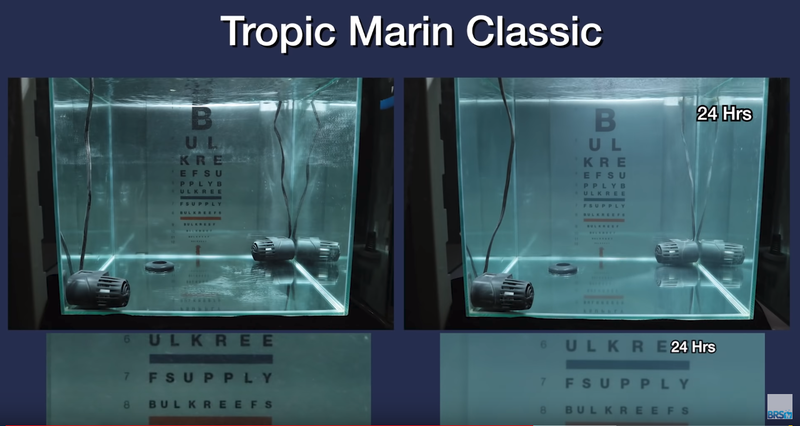 After 24 hours, Tropic Marine Classic was not full mixed for either clarity or contrast because both just don’t seem to full come back to the same appearance as the RO/DI water. By hour 2, it was very close to clear on line 12, however, we continued to see slight improvements over each hour where finally at hour 8, we called this one fully mixed on the clarity scale. 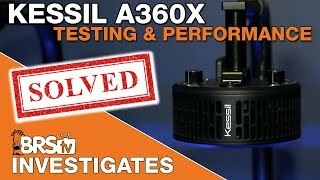 It did seem to take a few more hours to reach the fully mixed point without even the slightest of haze which actually happened by the time we hit hour 14, again we are probably splitting hairs but with such subjective results, we veered on the side of being critical for accuracy sake. Do salt mixes fully dissolve in less than an hour? We gave this a ONE on the Reef Fantasy Scale because none of the leading salt mixes we tested dissolved clear within the first hour. Mixing longer to achieve a homogenous solution likely has some benefits both with precipitation and irritating your tank’s inhabitants. 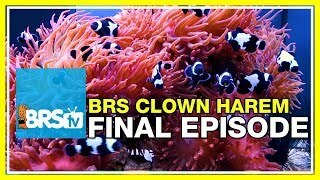 With that said, many reef aquarium hobbyists have mixed salt in less time than what we indicated without any negative results. When trying to decide which salt to use, you can use today’s experiment to help make the right decision for you and your tank. As for the second question, does the speed at which they mix clear really matter? This one is split right down the middle at a 5. 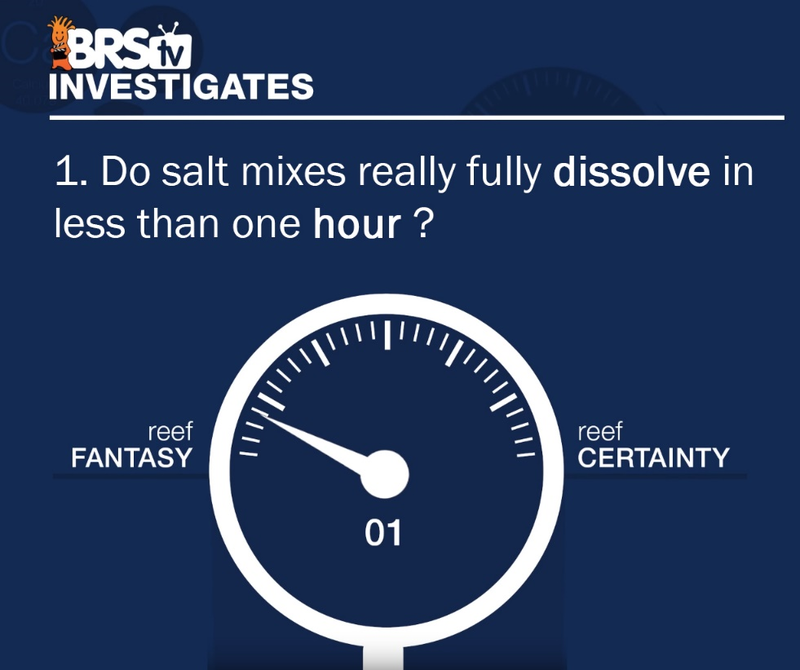 It is obvious that some salts do mix faster than others, but does it matter? 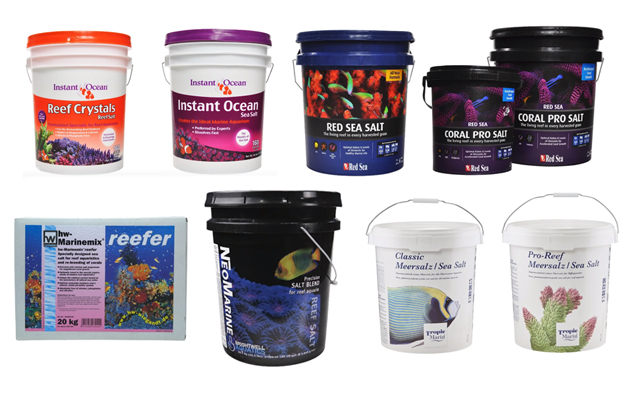 Each of these salts have produced undeniable success for a wide number of reefers and almost all of us have mixed our saltwater to less than perfect clarity. It is not critical that you pick the highest performing salt and mix it perfectly like we did. Best practice would be to mix your chosen salt mix for a set-time somewhere between 8 and 24 hours, then come back to use it knowing that most salts have probably fully dissolved and are ready to go by this time. 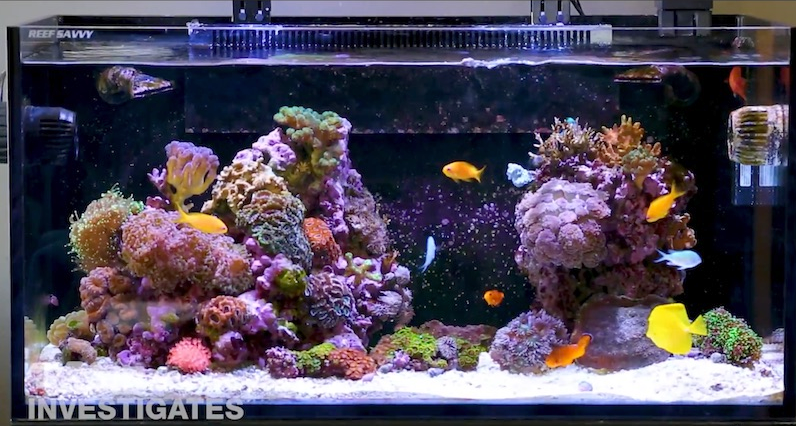 Learn more by checking out our complete playlist of Reef Tank Salt Mix videos. Join the #askBRStv Facebook Group to ask questions and interact with the community!